Theory of scales in music - what is a scale? What is a scale? The easiest way to explain scales is as a collection of notes that because of a musical reason have been grouped together. The benefit of knowing scales in music is that you know how to orient yourself among notes. This will among other things give you a foundation for improvising – notes in a particular scale always sound good played together – and composing. You don't have to read notes to be able to learn scales (but it is always good to be acquainted with note reading). Neither do you have to know a lot of chords, but if you already know some chords the scales will be much easier to relate to and subsequently memorize. And by knowing scales you will be able to learn chord easier – chords derive from scales. In many cases a scale consists of seven notes – this is the case of the Major and Minor scales. 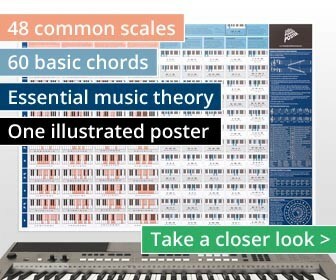 The scales are also octave-repeating, which means the pattern of notes is the same regardless if you play a scale on the left, the middle or the right side of the keyboard. On a full-scale piano, there is a total of 88 keys, but there are only twelve different notes which are repeated from low to high tones, from the base to the treble. On the illustration above, you can see twelve tones that make one octave and these notes also form a Chromatic Scale. C# is sometimes written Db, D# is sometimes written Eb and so on. These are called enharmonic notes and how they are written depends on the key they belong to. The symbols after the letter (accidentals) are known as sharps and flats. C# is spelled “C sharp” and Db is spelled “D flat”. This is of course only theory, and don't affect the sound, but is nevertheless good to know about. The notes are G - A - B - C - D - E - F# - G.
The notes are F - G - A - Bb - C - D - E - F.
You have seen two different scales where sharps (#) and flats (b) are used. The rule that decides if the note is raised or lowered depends on the intervals between notes in the scale. In the examples above, F# is a raised F and Bb is a lowered B. On some occasions you may observe two sharps or flats in adjunction to a described note in a piano score. These are called double-sharps and double-flats and needs a theoretical explanation. If we take the key of D# as an example, this key includes both D# and D, but to make it functional in a score with a key signature it must be D# and C##; otherwise, you would be lured to play a D# instead of a D.
See all double-sharps and double-flats listed in Appendix A. Music pieces are written in a certain key, like “Brandenburg Concerto No 1 in F Major” by J.S. Bach. It would be feasible to re-arrange this concerto to another key, like for example D Major. It would musically still be the same to a large extent, but the timbre would be different. See also The difference between scales and keys. Most songs start and end with the same tone which is the first note, or tonic, in the scale. Then you play notes from a scale, you could hear that the music seems to gravitate towards the first note, it is like some tension is left until you have return to the first note. This phenomenon is called tonality. Tonic (I): the first note of a scale which the scale is based upon, sometimes called the root. Super tonic (II): second scale degree, one step above the tonic. Mediant (III): third scale degree with a position halfway between the tonic and the dominant. Subdominant (IV): fourth scale degree, a fifth below the tonic and next to the dominant. Dominant (V): fifth scale degree. Submediant (VI): sixth scale degree and sometimes called supermediant. Subtonic (VII): seventh scale degree which is also referred to as leading tone because it musically “leads” back to the tonic. Why should you learn these terms? One great thing about knowing them is that you can have a better understanding of scales and chords in an abstract way. For one of many reasons, this will help you in transposing music to another key and give you hints while you are composing music. To give a concrete example: in blues you very often use the tonic (I), subdominant (IV) and the dominant (V) in regard of chord progressions. By knowing this theoretical relationship, you can play blues in all keys by using the same intervals. Intervals can also be used to describe the structure of a scale category. For example, the Major Scale can be written like: 1, 2, 3, 4, 5, 6, 7 and the Natural Minor can be written like: 1, 2, b3, 4, 5, b6, b7, referring to the intervals. Another way to describe the structure of a scale is by the word steps, which refer to the distance between notes. The most often used terms are half steps and whole steps. Between C and C# it is one half step, and between C and D it is one whole step. In the scale overviews on this site you will also see “semi-notes” (equivalent to half steps) and “formulas” used to describe the scales. It is mainly the same thing only described in a different way. For the Major Scale this will look like: 2 - 2 - 1 - 2 - 2 - 2 - 1 (semi-notes) and Whole, Whole, Half, Whole, Whole, Whole, Half (formula). See all steps listed in Appendix B. When a scale is presented, the tones are ordered from the root note followed by the tones that comes in order. This is not an indication that scales should be played in a certain order. When practicing yes, when improvising, no. Since the tones in scales are not played simultaneously where is no need for inversions of piano scales as sometimes is the case concerning chords. All double-sharps and double-flats and the notes they represent. C##: the same as D.
D##: the same as E.
E#: the same as F.
F##: the same as G.
G##: the same as A.
A##: the same as B.
B#: the same as C.
Cb: the same as B.
Dbb: the same as C.
Ebb: the same as D.
Fb: the same as E.
Gbb: the same as F.
Abb: the same as G.
Bbb: the same as A. All steps and the distances in semi-steps (semi-notes) they refer to. Whole and a half: three steps.